Have you ever heard the phrase, “work smarter not harder?” It can be applied in a lot of situations, reminding us that if we would just stop and think, we could find a much easier way to get the job done. This most definitely applies when it comes to changing out your seasonal tires. In the New England area, winter car services are a must. It is important to change your anti-freeze and windshield wiper fluid to make sure it won’t freeze during the cold winter months, and it is essential to switch out your all-season or all-weather tires to snow tires. 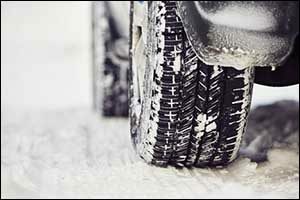 There are many advantages to using snow tires, including increasing your vehicle’s grip on the road and ability to maneuver during snowy, icy, and slushy weather. Changing tires out for the season can be a frustrating and back-breaking task, but it doesn’t have to be if you use these tips. When it comes to putting on your winter tires, there are two methods. The first is to do it yourself and the second is to pay someone else to do it for you. Learning how to do it yourself can help you to save a lot of time and money, as it seems like no one else thinks about winter tires until the snow starts tile pile up in the streets. LaCava Auto Parts and Services can help you get all of the tools and equipment you need to properly change and care for your tires year-round. Just stop by our Fall River car parts and accessories store or give us a call to speak with one of our team members about your needs. It pays to have an auto parts store in Fall River that you can depend on for all of your winter car services and supplies. Regardless of the method that you choose, you will need to store your winter tires during the fair weather months and then also store your all-season or summer tires during the snow-and-ice period that plagues New England each year. Make sure to have clean, cool, dry place to store your tires and enough space to store them flat on their sidewalls. They should also be out of direct sunlight and cleaned thoroughly inside and out, dried, and wiped down before placing them into storage. This goes for both sets of tires, the winter and the all-season. The more effort you put into storing your tires properly, the longer they will last and the easier it will be to use them again when you need them. Another great tip to remember is that it is also important to check the condition of both your wheels and tires whenever you make the switch. This will help you be aware of any need to replace the set that you are removing during the off-season. Check to make sure that the tread is wearing evenly on all four tires at the same rate. Not only will this help you to ensure that your tires are safe and ready for use, but it can help you spot suspension or alignment issues that you might not otherwise have noticed. Check to see that all of the wheel weights are on and in the right places and that the surfaces are clean so they can sit flush with the hubs when mounted. When you remove a set of tires, make sure to label them individually as you remove them with a piece of masking tape. You can write left front, right front, left rear, and right rear to help you remember where to put them back on after you change them out again. If you have directional tires, they can only be switched from front to back on the same side where they are designed to be installed. Symmetrical tires can be switched from side-to-side, making it easy to rotate tires and increase longevity. Winter and spring tire changes can help you to remember to rotate your tires twice each year to improve even wear and inspect the quality of your wheels and tires before extreme use or road trips. If you can afford to do so, consider purchasing pre-mounted tires that are designed for your specific vehicle. This will make changing out your tires a lot easier and ensure that everything is properly set-up and balanced for your vehicle as part of your winter car services. This will save you time having to mount your tires twice each year and also help increase longevity by not having to fully remove them each time. Make sure that you choose a safe and clean space to change your tires, either inside of a garage or on a firm and level driveway. Choose a floor jack that is rated for the weight of your vehicle and always use jack stands to support the weight, along with wheel chocks to keep it from rolling. LaCava Auto Parts and Services has all of the tools you need to safely change your tires and perform other essential winter car services. Having the proper size socket, a torque wrench, and any other helpful equipment can make a difficult and tedious job go a lot smoother. Check the inflation on all tires to make sure that they conform to the manufacturer’s recommendations for your vehicle and perform a visual inspection of any brake components and suspension equipment during the tire change to provide you with additional peace of mind for safety. If you need parts, tools, and accessories, make sure to visit our auto parts store in Fall River. 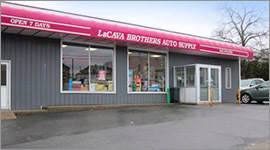 Contact LaCava Brothers Auto Supply by calling 508-676-1951 or stop by our location on Bedford Street. For over 70 years we have provided the Greater Fall River area with quality automotive parts and services.